This stunning dress is a bespoke creation, and features a lace bodice with pearl beads and sequins. The sleeves are 3/4 length sheer silk mesh, with appliqué lace matching that of the bodice. The back is lace with a key hole and satin covered buttons. The skirt flows from the bodice and in made from silk satin with a beautiful drapey silk chiffon over skirt. The skirt just brushes the floor which is perfect for dancing. Inside there is a lace up bustier to help maintain the shape. There is a beautiful beaded waist belt that has been sewn on to accent the waist. Picture 4 shows the belt tied in place and as it was sewn on there are no longer the ribbons showing at the rear. 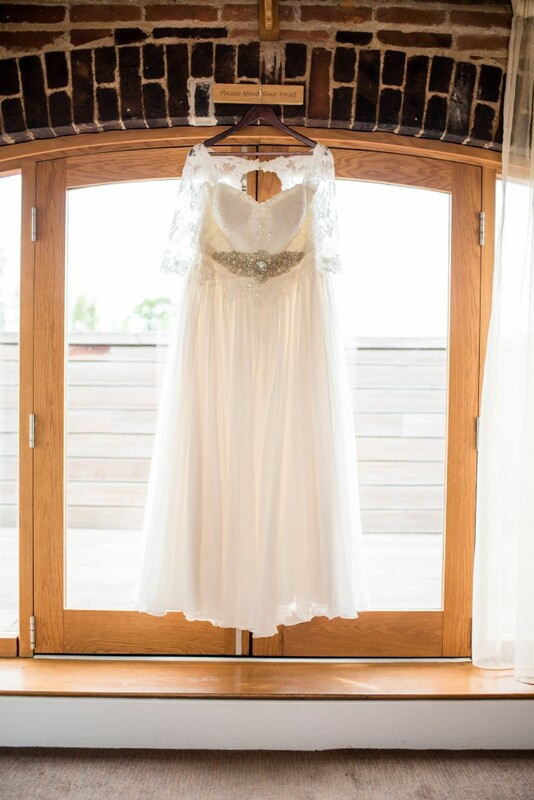 It has been worn once and then professionally dry cleaned using a specialist wedding dress service. This included the used of a UV light to detect stains invisible to the naked eye such as white wine and all stains have been treated. It has been stored in acid free tissue paper in a decorative box. If you have any questions please don't hesitate to contact me, Im happy to help.